Whispers of Hope by Beth Moore book review: The Scriptures tell us to pray without ceasing, However, how on Earth do we even start doing it? 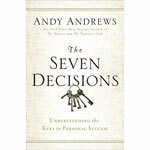 The Seven Decisions by Andy Andrews is a repackaged version of a Mastering those same decisions, separating the common from the astounding. If you like Christian historical novels, Linda Windsor’s Healer is a great choice. Follow the journey of an outcast queen in early Scotland.